Have you lost your car keys or maybe they got misplaced? We appreciate that losing your car keys can seem like a nightmare but with quick and efficient car keys made services from a professional locksmith, you can have new car keys in bare minutes. Well, you may have lost or misplaced your car keys, but that is no reason to worry if you have our number on speed dial. One call to us and you will be out of this situation within the quickest time possible, call BH Locksmith in Houston today at Phone: (281) 777-6030 or visit us at Address: 6720 Chimney Rock Rd #R, Houston, TX 77081. We treat each car key lost call urgently, and it is allocated top priority to make sure that your car remains safe. If you suspect that your car key is malfunctioning, we can make sure that it does not break down and you remain safe. Keeping our emergency phone number on speed dial will help you avoid any such situations. We promise prompt and efficient car keys made services as and when you need them at any time of the day and night. We offer rush automotive locksmith services at a fair price without sacrificing any of the reliability. BH Locksmith automotive Locksmith service aims to be second to none. Our team operates locally, 24 hours a day, all year long! We stand behind our work 100% of the time. We know that all customers will be satisfied with the work that Automotive Locksmith Houston NV offers, We take pride every job that we commit to, and we are not satisfied without happy customers. So we make that part of our mission here at Automotive Locksmith Houston TX. Whenever you need a locksmith for cars, trucks, or even semis, know that we will turn your frown upside down! Car Key Services for the following years: 1980, 1981, 1982, 1983, 1984, 1985, 1986, 1987, 1988, 1989, 1990, 1991, 1992, 1993, 1994, 1995, 1996, 1997, 1998, 1999, 2000, 2001, 2002, 2003, 2004, 2005, 2006, 2007, 2008, 2009, 2010, 2011, 2012, 2013. 2014, 2015, 2016, 2017, 2018, 2019. Acura Keys, Audi Keys, BMW / Mini Cooper Keys, Buick Keys, Cadillac Keys, Chevrolet Keys, Chrysler Keys, Dodge Keys, Ford Keys, GMC Keys, Honda Keys, Hyundai Keys, Infiniti Keys, Isuzu Keys, Jeep Keys, Kia Keys, Lexus Keys, Lincoln Keys, Mazda Keys, Mercury Keys, Mitsubishi Keys, Nissan Keys, Oldsmobile Keys, Pontiac Keys, Scion Keys, Toyota Keys, Volkswagen Keys, Motorcycle/ Scooter Keys. You no longer have to worry so much when your car key gets missing, damaged or even stolen. We offer a 24 hours car key replacement service tailored to handle car key emergencies within an hour or less. We work on all car brands and models and irrespective of your location in Houston BH Locksmith delivers fast-response car key service at an unbeatable price. Replacing your car key and remote can be very expensive, sometimes running in the hundreds of dollars even thousands in some cases. 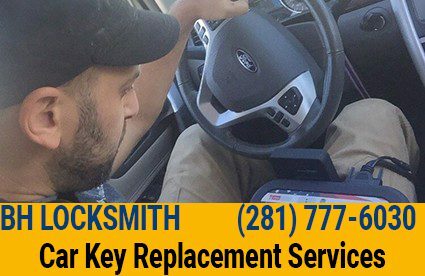 Most people mistaking believe that replacing or duplicating their car key or remote takes an expensive and time consuming trip to a dealership, Why waste time and money when you can call BH Locksmith Houston for cheaper and faster service! We are the best automotive locksmith in the industry and we can save you the most money. car keys needs? Give us a call us right now.